The Common App is the most widely used application platform for students applying to US universities. Our latest BridgeU guide enables your teachers and counselors to help students write a truly individual & original Common App essay. If you have students who are looking to study at a university in the US, then there is a high probability they will submit some of their applications through the Common App. The Common App is the most widely used admissions platform for US university applicants (though it’s also possible to apply to destinations outside the US). Over 800 higher education institutions accept applications through the Common App. This helps to speed up the admissions process, since students only have to submit relevant personal information once. In addition to relevant high school transcripts, test scores, information on extra-curricular activities and parent/legal guardian information, all students applying to university through the Common App must submit a standard application essay. Note: It’s important to bear in mind that some universities & colleges will ask your students to write additional supplementary essays, so it’s important that both counsellors and students are aware of the requirements of different institutions. The Common App essay is a means for student applicants to tell a compelling story about themselves, to express their personal ambitions, and convey a sense of their character, community and identity. Students writing their Common App should ensure they take the opportunity to really show off their personality. 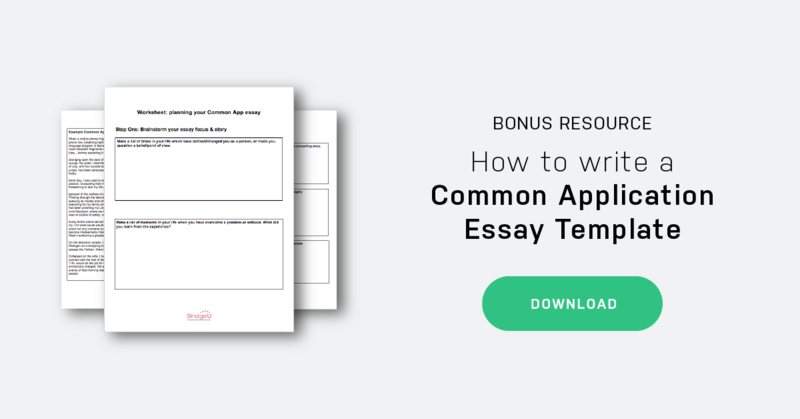 In planning a Common App essay, students are encouraged to take advantage of seven essay prompts in order to help them structure their responses. What are the Common App essay prompts? The Common Essay Prompts are essentially a list of topics, which allow students to focus and structure their responses around a particular theme or story. The Common App Essay Prompts for the 2018/19 academic year have remained unchanged from the previous application cycle. Describe a problem you’ve solved or a problem you’d like to solve. It can be an intellectual challenge, a research query, an ethical dilemma – anything that is of personal importance, no matter the scale. Explain its significance to you and what steps you took or could be taken to identify a solution. Share an essay on any topic of your choice. It can be one you’ve already written, one that responds to a different prompt, or one of your own design. As you will see from the prompts above, there is plenty of room for an applicant to make their essay a truly individual piece of work (in fact, the final question allows a writer to design his/her own topic from scratch). This means students can draw inspiration from multiple sources, or go entirely with their own creativity. Before your students start their Common App essay, it’s worth encouraging them to make notes on how they can demonstrate the core qualities which admissions officers will look for in any application. Students need to think about how they can demonstrate the following. The ability to collaborate, and demonstrate teamwork is something which university admissions staff will be looking for. Encourage your students to think about a moment where they learned the value of teamwork. Ask your students to make a note of any extracurricular activities which may connect with their academic passions and interests. Extracurricular activities are a great way for students to demonstrate relevant leadership and organisational skills and reflect on any experiences or challenges which they have overcome. Can they demonstrate the ability to put an idea into action? Can they name a time when they’ve started something (a business venture, a club, a creative project), and/or pushed it to be bigger and better? Have they achieved something noteworthy or unusual? Students should think about how they can demonstrate a care for the wider community and/or the welfare of others, whether it’s through volunteering or any of their other extracurricular activities. Community service is a great way to demonstrate citizenship and a sense of social responsibility. Students writing their Common App essay will be asked to demonstrate an understanding of other cultures, or the ability to speak another language. Encourage your students to think about any traveling or time abroad which may inform their university application. Whilst students have a range of essay topics to choose from, it’s also worth remembering that all the Common App essay prompts are designed to encourage respondents to cover several important themes. So, as your students prepare to to write their Common App essay, it’s important that they ask the following questions. Which personal experience from my life will make an interesting story? How can my essay tell a story and keep a reader interested? How can I best illustrate moments in my life which have changed/defined me? Will this story show me in my best light? These questions should inform every section of the Common App essay, and will allow students’ responses to be that much more structured and coherent. The importance of the opening line in the Common App essay can’t be understated. It’s a chance for applicants to demonstrate flair, originality and wit, and to really grab the reader’s attention. That’s why brainstorming the opening line is an important exercise in itself. Check out these powerful Common App opening lines from students at some of our BridgeU partner schools. These openers also come highly rated from US admissions staff. Both these opening lines have short, sharp sentences which instantly grab the reader’s attention and offer intrigue as to the potential topic the essay could be covering. Both immediately offer the promise of an essay which will be story-driven and dramatic. Both openings also suggest a story which will be about a life-changing event in the writer’s life. In short, these opening lines make the reader want to know more. Vivid storytelling, and the ability to hone a narrative is vital when writing the Common App essay. Here are some essential components of a great essay which are worth considering and practicing. This is a sample from an essay that discusses the terrorist attack in London on July 7, 2005. Not only does this essay tell a compelling story of the applicant’s experience of what was a traumatic and newsworthy event, but its use of vivid imagery and descriptive language is very powerful. For example, consider the description that London “had been paralysed”; personifying the city of London in this way helps to demonstrate the writer’s empathy and awareness. It’s also a much more effective use of imagery than simply saying something like “London was at a standstill”. Each day, I was used to reading and talking about current events. Understanding world events is my passion. Evaluating their importance is my responsibility. Today, however, these same events were threatening to tear my life apart. I tried to imagine how any religion could not only condone but encourage these actions. I thought about how our Western culture had become irredeemably intertwined with other cultures, all of which seemed mutually uncomprehending. Wasn’t achieving a greater level of cross-culturalism meant to be a good thing? These are two further excerpts from the same essay. In this extract, we gain an insight into the writer’s personal passions. These two extracts tell us about a time where the writer realised that something they were normally passionate about could, in their own words, tear their life apart. The writer prides themself on their ability to make sense of world events – this was an event they struggled to make sense of, a moment when their status quo was challenged. Collapsed on the sofa, I realised that the mission I had chosen, to convince my school community to connect with the rest of the world, to some extent was no longer necessary. July 7th, like September 11th, would do the job for me. I got through that day, as did my family, physically unscathed, but emotionally charged. We all have a choice: to connect with the rest of the world or to cut it off. The events of that morning reaffirmed my choice. Non-interventionism is no alternative. Hell is not other people. The writer uses powerful storytelling techniques to end their essay, and shows that they end their account of the July 7 having gone on a journey. Having faced a moment where their life was thrown into chaos, the writer reaffirms their decision to connect with the rest of the world. So why is this Common App essay so successful? Put simply, it creates a compelling picture of both the writer’s worldview, and their aspirations for the future. It effectively demonstrates the writer’s core values by dramatising a moment when those values were called into question. For the 2019/20 application season, Common App are launching a new integration platform, and BridgeU will be one of their first partners. Integration between the two platforms will allow for an easier transfer of data, enabling counselors to more easily send supporting documents, via BridgeU, to Common App institutions. This will help to smooth the application journey for students wishing to study at a North American university. If you’d like to know more about how this new integration could help your school, contact us at hi@bridge-u.com. As your students prepare to submit their Common App essays, make sure that they are paying attention to the following checklist. Is their Common App essay telling a compelling story about them? Does their essay contain a powerful opening line? Are they using descriptive language and vivid imagery? Are they writing with passion? Is the essay portraying them in the best possible light?